These are the 3 Products that made Victoria over $2250 last month. 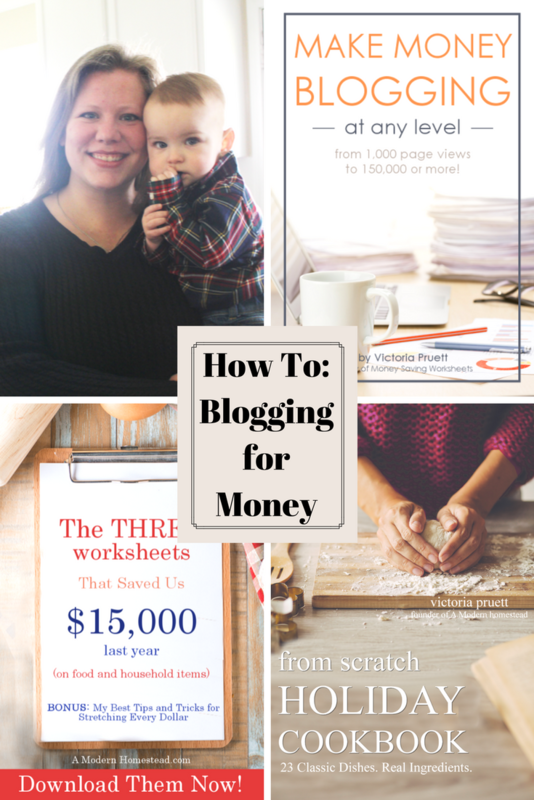 Ready to learn how to start blogging for money? I sure am. It’s time. That’s why I’ve started seeking out other Mom Bloggers who are already doing it. 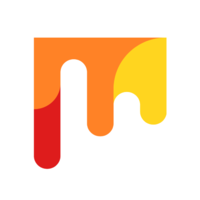 One look at my NEW Pinterest Board, Make Money Blogging, and you’ll know I’m on now a mission to turn my hobby into a business. The thing is I still have a fairly new blog so it doesn’t have a huge amount of traffic yet. Which is exactly why Victoria Pruett’s book, “ Make Money Blogging at ANY Level “ appealed to me. I needed answers. And I got them for a mere 20 Bucks ($20). “Within 4 months I had completely replaced my husband’s income with less than 20 hours a week of effort. In another 4 months, my blog income was DOUBLE what he had been making and it kept on growing! And So Much More. In case you missed it, you can read my full review here. 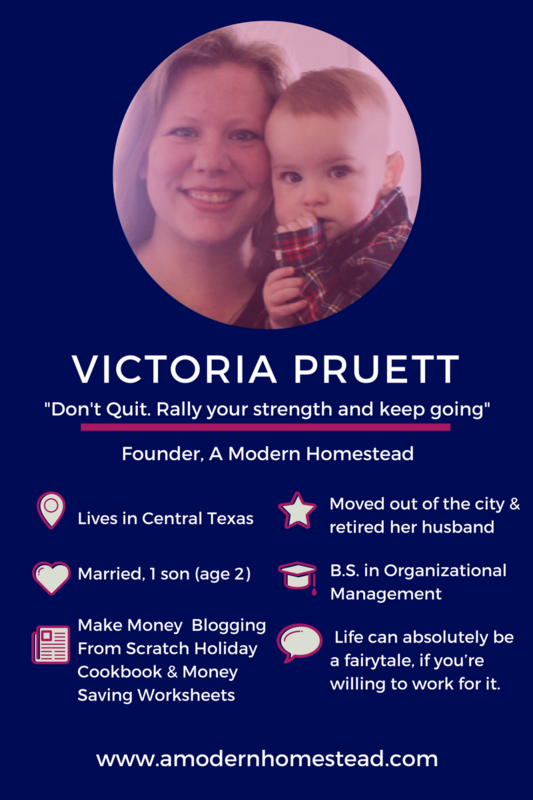 Just to give you an idea of how Victoria’s “how to” translates into actual income – in her latest post, Victoria gives a breakdown of the income A Modern Homestead generated last month. I don’t think it’s a secret, but hard work is what it takes to be successful. And it doesn’t matter if you’re a blogger or a musician, or a stock broker… Hard work and perseverance will take you anywhere you want to go! Is there anything you know now, that you wish you knew when you started out as a blogger? I wish I had known that I really would get out of my blog what I put into it. That the hours I invested at the beginning when it felt like I would never “make it” would lay the foundation for success in the coming months! Trusting my husband when he asked me to give up our home in the city in pursuit of a different life. I never thought I would be brave enough, and it’s been the most amazing experience of my life. How long did it take before you started making money blogging? It took me 2 years total. However, within 4 months of treating it like a business and not like a hobby project I was able to completely replace my husband’s income! Which tools of the trade have been enormously helpful for you? It’s not really a tool of the trade, per se… however, persistence is the one thing you HAVE TO HAVE in order to make it as a blogger. There are days when you will want to quit, to throw in the towel and get a “regular job”. Don’t. Rally your strength and keep going… because it will pay off if you put in the work. Do you have a message you would like the world to hear? Stop living a life you hate just because you think you’re supposed to. While blogging may not be for everyone, I do believe there is a meaningful life just waiting for you. You just have to be brave enough to reach for it. 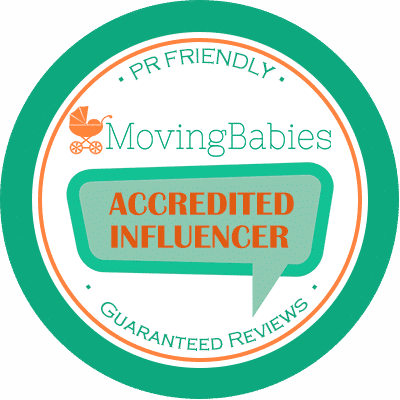 Care to Share any highs or lows as Mom Blogger? The highs of being a Mom blogger are that I get to be home more with my son while still making money for the family and doing something that I love. But on the flip side, there are days when I feel like all I do is work. Fortunately, those days are rare! What has been the greatest challenge for you to overcome? The feeling that I could be doing more on my blog, but I want to spend more time with my son, while at the same time feeling like I work all the time! Mom guilt is real, and hits you when you least expect it! Do you have any daily rituals to maintain a work-life balance? Unless I have a big deadline, I only work during nap times and for 2 hours after my son goes to sleep at night. This leaves me completely free to spend time with him during the day without the pressure of feeling like I “should be working”! would you be at peace knowing you had lived a full, happy and meaningful life? Or would you feel you were dying with your song unsung? God willing, this won’t be an issue! But if something happened to me I would know that I took the big risk of leaving the conventional work world behind to pursue a life I actually loved. My son would know that I sacrificed a lot to create a different life for our family! Is there a book or a song or a movie that has had huge significance or meaning in your life? It might seem cliché to say so, but the Bible has obviously been a huge part of my life and given great meaning to my search for fulfilment. It’s not just a book of stories, it’s a book that shows the constant and never ending faithfulness of God. The knowledge that God is faithful no matter what has given me the courage and strength to follow His leading, even when I had no idea how it would turn out. Who is your target market? If I were to give you a referral, who would I be looking for? My site is for people who are dreaming of a simpler life, who want to grow their own food and pursue the skills of yesteryear like canning, knitting, from scratch cooking, and frugal living. They may live in the city, or on 100 acres… but the desire for a “real, unprocessed life” is what drives them. 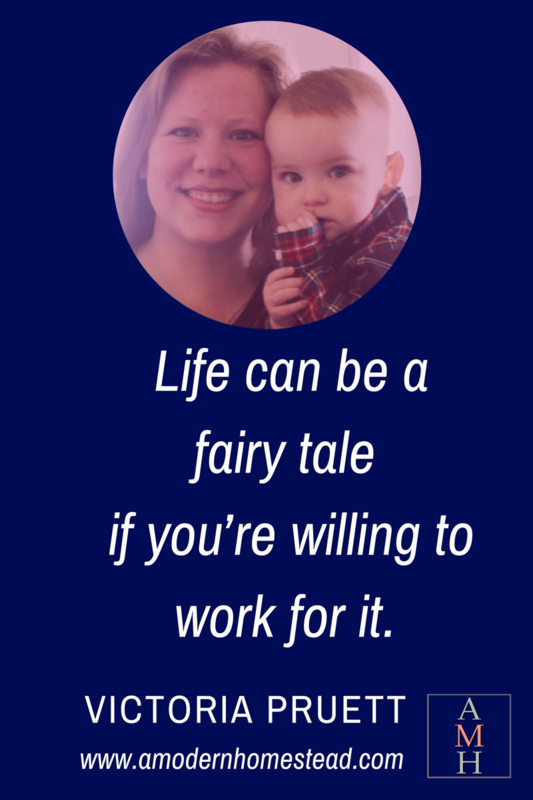 Life can absolutely be a fairy tale – if you’re willing to work for it. Ready to start living your fairy tale life? 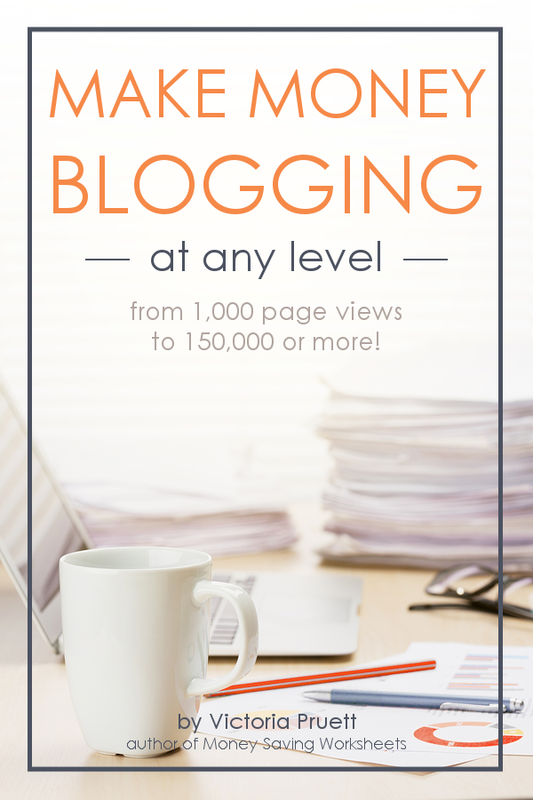 Take the first step today, get your copy of Make Money Blogging at ANY Level. Not a mom blogger but truly inspired by your interview. I have been looking for a sign on whether or not i should keep at it and here it is! Keep up the wonderful content! This is a great share Lauren. Thanks! Thanks Andrea. Glad you enjoyed. Thanks for the remarkable article! You are an inspiration for all of us working moms! I have just started blogging and I am still in the hobby phase! I started about 2 months ago and it is just a time factor thing stopping me at the moment! I will definitely check this book out, it seems it kept you motivated and on a good path! Fab Hailey! I’m so happy to hear you’re so inspired! Wishing you well on your blogging journey. What an incredible turnaround Victoria has made! That is super cool. I just recently started blogging. As a college student, it has been incredibly intimidating to commit to myself the time needed to get my website up and running. I have to consistently remind myself to just take it an hour at a time. Victoria, your story is inspiring! And thank you for sharing. I’m feeling a little extra motivated now. Super cool, hey Helen? I love your idea of taking it an hour at a time. I’ll make sure Victoria sees your message. I really enjoyed this interview as it opened my eyes on my own situation as a blogger! I must say that I am not exactly regular to post articles when I should. I understand now why my blog does not make it the way I want. But I commit now to persist and keep posting until I reach my goals! Thank you for this advice and keep going! Love this! Both of you are inspirations! It’s hard work to get an online business off the ground as a Stay At Home Mom – I’ve been working steadily for a year on my own blog (also during only naps and after bedtimes!) and I have yet to break even with costs… but that’s ok! I’m pretty certain I can make this work someday. Reading through your interview with a successful Mommy-Blogger was just what I needed today though as I contemplate the future of my site.